Wouldn't it be interesting to keep a log of your location at exactly 16:00 once a week? Let’s do that on Mondays: imagine holding up a map of your neighbourhood and drawing a dot to indicate your current whereabouts, same time every week. At the end of a calendar year you could pick up the map and check it: Maybe most Mondays at 16:00 you’re almost at the same coordinates – at work! But not exactly at the same place; perhaps one Monday at 16:00 sharp you were at the office next door or you had to get up from your chair and cross the corridor to answer the doorbell. Maybe one Monday you left early, so your location indicator showed up at home at 16:00 or maybe it was a free day after all, so your dot was far away, pointing to the nearest beach. How would it really look, that graph of your exact position at 16:00 every Monday over a year? What does change though is how you see the analemma – and that depends solely on your geographic latitude: A yearly analemma over Athens is a bit different compared to a yearly analemma of the same time of day over Paris or Rome. The main change is how much the “figure 8” shape is tilted and how high above the horizon does an analemma (taken at the same time from different locations) appear. So how would it look from, say, Sydney? Well, about the same as from Athens, since their latitudes are almost inverse. But how would it look from an extremity such as the North or South Pole? 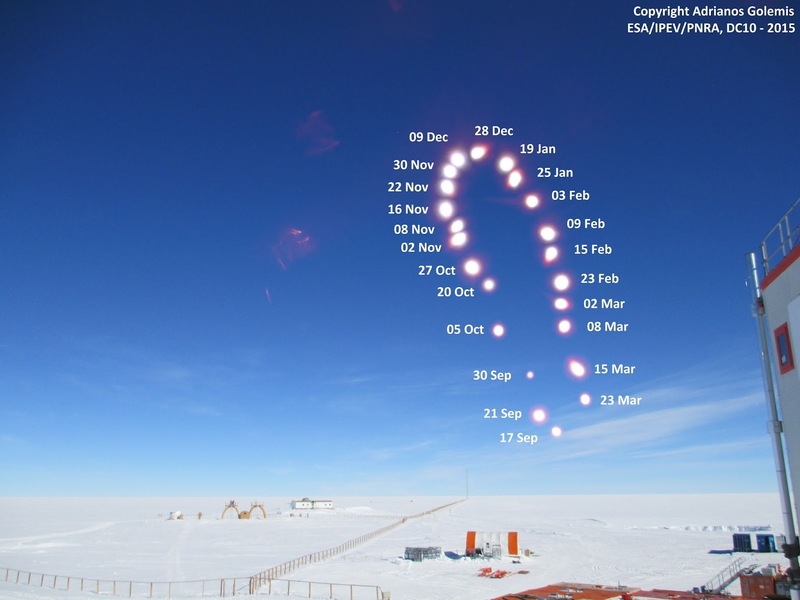 Having spent one continuous year at Concordia Station, Antarctica and since my own location at 16:00 every Monday wouldn’t really change at all, I decided to step up to the challenge of photographing the analemma. To achieve that, I had to take a photo of the Sun with a special filter not only at the exact same time once a week, but also from the exact same spot in the Station which was particularly challenging with the winds and low temperatures outside. Still, the result was rewarding as it constitutes what seems to be the first-ever capture of the analemma from within the Antarctic Circle. As you can see, near the poles only one lobe of the analemma is visible (at Concordia we experience a 3-months-long polar night) plus the shape appears almost vertical. 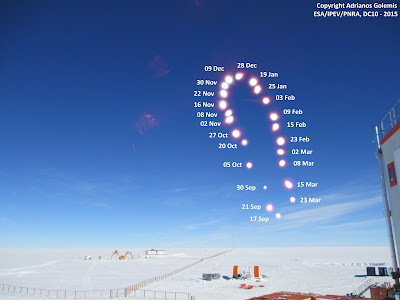 Picture #101: The Analemma in Antarctica. This picture was selected as NASA APOD (Astronomy Picture of the Day) on September 23, 2015. Wait… one last question: how would the analemma look from the surface of another planet, say Mars? Well, help yourselves: http://apod.nasa.gov/apod/ap061230.html !